The marriage laws require that your ceremony contain just three elements; a vow, a pronouncement, and the signing of your license. Everything else is optional and up to you. 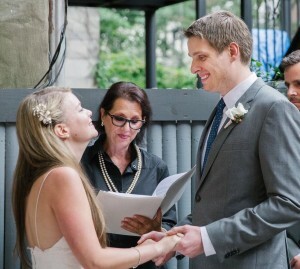 Your custom written wedding ceremony will reflect your choices. Below are a few of the most common themes for weddings. You might select one or have a combination of all three. Your personal ceremony can be about the two of you, focusing on your love and commitment to each other with or without any reference to religion. A ceremony that is personal, meaningful, and filled with the magic that brought you together and all that is uniquely you. If religious rituals, or cultural traditions resonate for you, I can easily incorporate them into your ceremony. Together we will explore what holds meaning for you. I am educated and experienced in the religions of the world and have creatively blended wedding rituals for couples who are– interfaith, intercultural, exploring new paths, desiring elements from the religion of their birth, while honoring the philosophies of their present. My experience spans the mystical and traditional forms of — Christianity, Judaism, Sufism, Islam, Buddhism, Hinduism, Yoga, African, Native American and many other paths. It is all open to you. The most rapidly growing segment of the American population are those who describe themselves as “Spiritual But Not Religious”, “Religiously Independent” or “NONES”. Spirituality is very personal and expresses itself in unique ways in each individual. 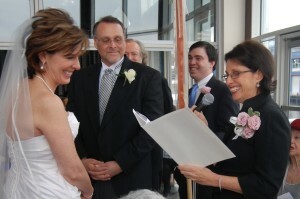 As your wedding officiant I will explore your spiritual beliefs and core values with you, find out what holds meaning for you and design your wedding ceremony to authentically reflect who you are. We live in amazing times, and I am so thrilled to finally be able to provide everyone with an amazing, personal wedding ceremony. Whether you are eloping to New York or a local who just adores Central Park, these 843 acres are filled with so many romantic locations for your wedding ceremony. New York City is a mecca for wedding couples from all over the world. Its iconic parks, hotels, and public buildings attract couples from around the globe and from other states as well. 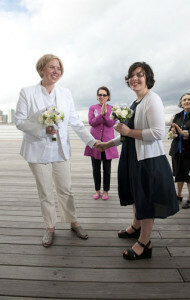 New York is the perfect place for your destination or elopement wedding. Have the wedding of your dreams for less. 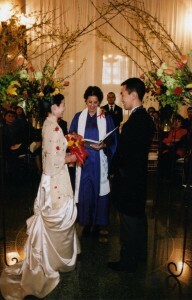 Same amazing, custom wedding ceremony, (Same Venue, Same Cuisine). Schedule your celebration on a Monday, Tuesday, Wednesday, or Thursday. Ceremony and ritual have been a part of the human experience for all of existence. We mark all rites of passage from birth, through life’s peak moments, to the end of life with a community ceremony. Baby Blessings, Vow Renewals, Second Marriages, Memorials.